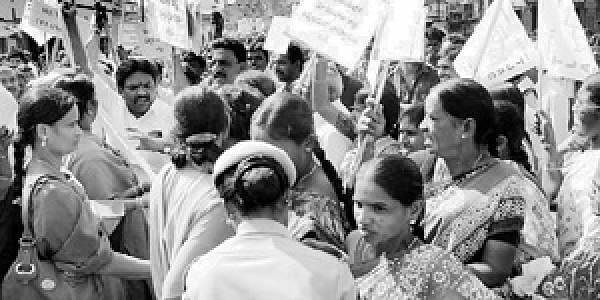 Telangana activists raise slogans and try to disrupt the Rachabanda programme in Warangal on Tuesday. WARANGAL: Fearing a repeat of yesterday’s disruptions, ministers and public representatives of the ruling party have decided to keep themselves away from Rachabanda on the second day of the programme. Officials were turned away by T activists resulting in cancellation of the programme at several places in the district. In Janagaon division, Rachabanda was not held in a single village. In Eturu Naagaram mandal gram sabhas in Shapelli and Chelpaka villages passed resolutions demanding that the UPA government introduce a bill in the coming budget session of parliament for formation of a separate Telangana state. All the ruling party elected representatives, including BC welfare minister B Saraiah stayed away from Rachchabanda programmes. In fact, Saraiah, who had a bitter experience yesterday in Rachabanda had left for Hyderabad. Warangal MP S Rajaiah, though was very much in the city, decided to stay put in his residence. In Kasibugga and Christian Colonies in the city, Zilla Parishad chief executive officer Bheema Naik attended the oprogramme but BJP and TRS activists protested against the police taking their leaders into preventive custody. In Christian Colony, BJP city incharge Ranjith uprooted the tents and damaged the chairs at the venue. He was taken into custody by the police. He was released later following demonstrations by BJP activists. In Warangal West Assembly Constituency, TRS activists pulled down the tents and damaged the furniture at Dargah where Rachabanda programme was scheduled to begin. Here too, the police took TRS activists into custody but later released them when the party workers organised a rasta roko. In Madipelli village in Nallabelli mandal, locals diverted the vehicles of officials. The police took Narsampet TJAC convener A Srinivas into custody but had to let him off when three students climbed up a mobile tower and threatened to jump down. In Station Ghanpur, local MLA T Rajaiah did not participate in the programme. The officials who went there to participate were forced to return as people did not allow them to hold the event. In Mahabubabad mandal, officials had to leave half way through the programme due to disruptions caused by some locals.